In a Nutshell: When consumers shop online through Goodshop, a percentage of their purchases go toward a cause of their choice, at no extra cost. By partnering with some of the biggest names in the retail industry — Staples, Apple, Vistaprint, Old Navy — Goodshop uses everyday transactions to add to the $12 million dollars it has already raised for causes that range from local animal shelters to international refugee aid. With nearly 125,000 nonprofits, local schools, and personal campaigns currently on the site, and more added every day, Goodshop is changing the way people give. JJ Ramberg, co-founder of the site, thinks shopping through Goodshop is a no-brainer because it enables consumers to give at no expense to themselves. The bake sale is a staple of school fundraising because it is so easy. An individual or family bakes a pie, a cake, or some brownies and donates them to the school to sell. The proceeds go directly to the school group that needs them — PTA, glee club, debate team — and the school churns along until another project needs funding. Then, out come the rolling pins and baking sheets again. Fundraisers and charity events are constant because they have to be, and they require a lot of effort. Staying a step ahead of a community’s conscience means nonprofits are always looking for the next way to engage with people. So, imagine if a fundraiser allowed someone to simply shop online — as they normally would — and donate to the cause of their choice, even that local PTA, at no cost to the customer. What’s more, imagine if the customer received a discount for their purchase as an added incentive. It may sound too good to be true, but this is exactly what Goodshop does. Click through Goodshop’s website to make a purchase on any partnered retailer’s site (or download the company’s browser plug-in) and Goodshop will give you access to the best coupons and deals and donate a portion of your purchase price to the cause of your choice, whether that be the Red Cross, a fund to pay for your dog’s surgery, your child’s college fund, or an elementary school. All you have to do is shop through Goodshop, nothing else about your online shopping experience changes — except, of course, that a cause will benefit from your purchase. Goodshop was co-founded by JJ Ramberg, host of the MSNBC program Your Business. To JJ, contributing to a good cause with a purchase that was going to be made anyway is a no-brainer. Her site has raised $12 million and has helped countless causes across the country since its launch in 2007. 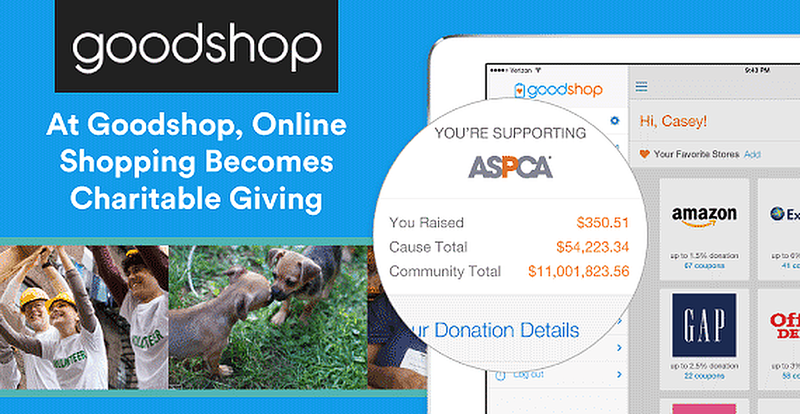 Now, Goodshop is focused on making connections with retailers to help raise funds for the latest campaigns — like the one raising money to help 74 puppy mill victims — signing up on their site daily. Online shopping has been steadily increasing, but it recently surpassed a huge milestone: For the first time, people are buying more things online than they are in stores. According to a recent survey by analytics firm comScore and UPS, consumers are doing more than half of their shopping online with revenue this year expected to surpass the $341.7 billion in sales last year. If even a small a portion of each of those online sales had gone to a nonprofit or a local school, the numbers would be staggering. Goodshop donations usually range from 1% to 30% of the total price of an online purchase, so if half of last year’s online shopping had been done through the site, charities would have received over $854 million — and that’s just at the 1% donation level. Goodshop has partnerships with many leading retailers and popular brands. Goodshop is partnered with thousands of retailers, including big names like Target, Gap, Staples, Apple, and Expedia. Shoppers can choose from a curated list of deals — for example, great savings on airline flights — or click on a link that takes them directly from Goodshop to a storefront to shop as they normally would. In either case, Goodshop makes a donation on behalf of the shopper. Fifty percent of the referral fee Goodshop earns by connecting consumers to partner stores is donated to a nonprofit or school, a win for the charity, the consumer, the retailer, and Goodshop. “We’ve been able to provide brands with a nice way to help their customers give back to causes they care about and consumers a great way to feel good about their shopping,” JJ said. JJ and her brother, Ken Ramberg, launched Goodshop’s parent company — Goodsearch — in 2005 with the idea of donating money for every online search performed through the site. JJ Ramberg and her brother Ken Ramberg. John Park, the company’s CEO, took us through the company’s early thought process. JJ worked as a reporter for CNN when she and her brother began working on Goodsearch in 2004. Seeing the devastation of Hurricane Katrina in Mississippi and Louisiana solidified her resolve to find a way to help on a local level. Goodsearch was the start, but Ken and JJ wanted to do even more. They shifted their focus to the retail industry when they launched Goodshop, and they found more partners and more money for good causes. Soon, communities took interest and added local charitable causes to Goodshop. And they recently launched GoodshopGive, which allows anyone to set up a campaign for something they care about, whether that is helping raise money for a new school playground, medical care for a loved one, or any other cause. JJ’s business acumen helped make Goodshop a success from the beginning. When not working with the website, JJ hosts the MSNBC show Your Business, which focuses on entrepreneurship. She has also written a book entitled It’s Your Business: 183 Essential Tips that Will Transform Your Small Business. Although she is a successful TV personality and author, her real passion is giving back, and she personally uses Goodshop to support Food Allergy Research & Education (FARE) in finding a cure for her daughter’s and nephew’s life-threatening food allergies. Goodshop benefits close to 125,000 causes, and that number is constantly expanding, John told us. What’s driving that expansion is the ease with which people can sign up and how much a cause or campaign stands to earn through the partnership. Just 3% donated from 100 $500-purchases brings in $1,500 to a cause. Goodshop estimates a nonprofit or school can earn thousands when supporters shop using the site. Stories of Goodshop’s real-world impact are everywhere. In New Mexico, an animal shelter was able to keep its doors open thanks to the timely arrival of a Goodshop check. Sunny Aris, the Co-Founder of Animal Village NM, said she felt completely hopeless. “I had no money for payroll, no one to borrow from, and had depleted all of my personal funds over the past month.” When the check from Goodshop arrived, she said she burst into tears. She also touted Goodshop as being a good way to keep money local, even when a consumer is shopping at a big retailer. The impact can also be felt in St. Louis, where Goodshop is being used to help the Foster and Adoptive Care Coalition with funding to provide foster children with presents around the holidays. “Every dollar that we raise through Goodshop helps us find families for kids,” said Debbie Genung, the coalition’s director of development. Because there’s no limit on the number of organizations that can sign up, Goodshop reaches such a wide group of nonprofits, schools, and individuals with personal campaigns that the consumer is bound to have a vested interest in shopping for one of them. For many worthy causes, Goodshop has become the new bake sale, minus the mixing of ingredients and the hot oven. What matters most to JJ is how, by harnessing the power of online shopping, amazing fundraising results are possible in the name of medical research, buying books for local libraries, and helping clean up pollution from city rivers. When she talks about Goodshop, her passion for helping is evident. After all that she has done through Goodshop and Goodsearch, does JJ ever take a step back and bask in her accomplishments?